Definition of services volleyball ~ Hellow Volleyball. Still peeling on my friend all about volleyball and students. 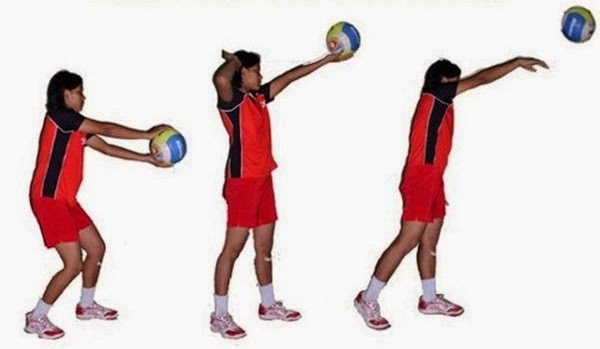 actually about we examine in detail the basic techniques of each item volleyball has different meanings and definitions. for more details in this occasion I will discuss first volleyball servicing problems. when we speak about we must serve him just hitting the ball to start the game, but it could be translated and how these services can actually be categorized and can be done in volleyball. Beginning service only is the opening blow to begin a game, according to the progress of the game that the technical service currently only as the beginning of the game, but when viewed from the tactic has been to attack a team that started to gain value. Because kedudukanya very important then the coach and gym teacher recommended always try to create a basic form service techniques that can make it difficult for the opponent, even the service can kill your opponent to get the value. There are several definitions of services including by Nuril Ahmadi (2007: 20), service is hit the ball from behind the line of the game field beyond the end of the net to the opponent, while Dieter Beutelstahl (2008: 8) defines service as the first touch with the ball. Service is also interpreted as the first blow that started the series of back and behind the ball in the game (Sarumpet A. et al, 1992: 95). Based on the opinion of several experts on the definition and description of the service, it can be drawn a conclusion that the service is performed blow from the rear end of the field that started a series of back and behind the ball as well as the first touch with the ball. Now you have to know the meaning of service in a volleyball game, I think it's so first because I was too tired and we've me up for the distribution of typing. see u next time.